The idea behind Giving Tuesday is simple; on Black Friday we shop, on Cyber Monday we shop some more, on Giving Tuesday we give back. Besides all the money we raise, we have an opportunity to win cash prizes from Crowdrise just for participating in their Giving Tower Challenge. We need YOU, to join us by making a Crowdrise profile (it’s super easy and you know your dying to use that selfie for a profile pic) and joining our team! You will be asked to log in if you already have a profile, or to create one. Hit the “Edit Fundraiser” tab to personalize your story. Our pictures and story will be there as a default, but your guaranteed more donations if you make your page more personal. Why do you care about this cause? Send your link to all your friends and family and ask them to consider donating, even the smallest amount can help. You can find your link by going to the Edit Fundraiser tab and copy the link provided. 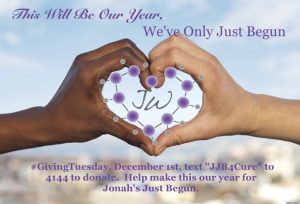 *The Giving Tower will go live on November 24th and run through Giving Tuesday on January 6th. Stay tuned for updates, November 24th is right around the corner! Let’s make this year OUR YEAR.